I have never forgotten my years of bartending while in college. Years later, I continue to fine tune my bartending skills and enjoy recreating some of my favorite cocktail recipes using fresh ingredients and a homemade twist. As the weather heats up, I am so inspired by the beautiful produce and vibrant colors. 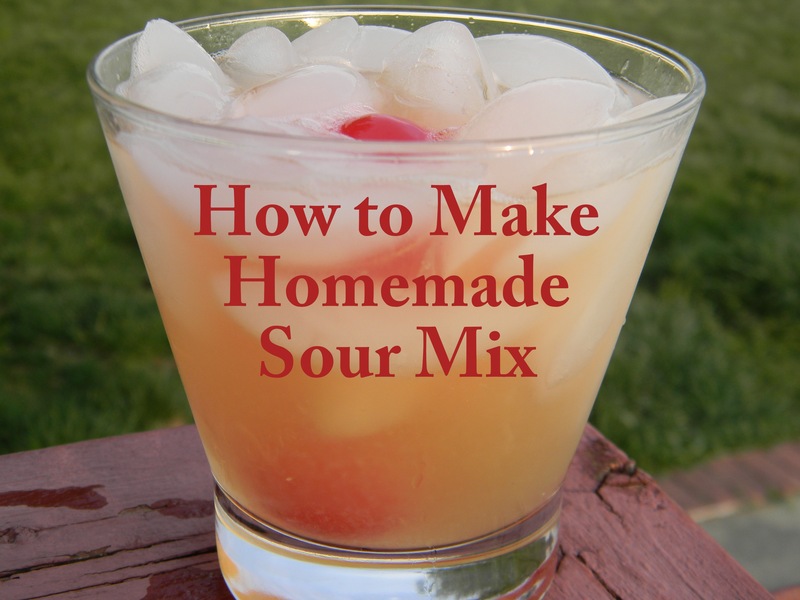 For this post, I will walk you through a very easy process for How to Make Homemade Sour Mix. Sour Mix (also known as Sweet and Sour Mix) is a popular mixer in many cocktails. The store-bought kind is filled with chemicals and preservatives and honestly, doesn’t taste very good. With a few fresh ingredients, some sugar and citrus reamer, you can learn how to make homemade sour mix in minutes. Hint, my homemade sour mix uses grapefruit. The grapefruit adds such a nice, sweet flavor to the sour mix. It’s perfect. How to Make Homemade Sour Mix includes more than just fresh citrus and some sugar. You need a nice, air-tight bottle to hold the homemade sour mix. I made my recipe in a large jug, which once held homemade root beer I picked up while visiting Amish country. My recipe filled the jug up about half-way. I like to make my homemade sour mix fresh, as it only keeps in the refrigerator for about a week. Squeeze lemon, limes and grapefruits to produce the necessary amounts of juice. Use the homemade sour mix in your favorite cocktail recipes. After you have finished making your homemade sour mix, you are now ready for cocktails. On this particular day, I opted to make a Whiskey Sour using Jameson Whiskey. In a shaker half-filled with ice cubes, combine the whiskey and homemade sour mix. Shake well. Strain into a glass (I like my Whiskey Sours over ice). Garnish with the cherry (I like to add 2). Homemade Sour Mix can also be used as the base for perfect Margaritas. Other uses include Amaretto Sours (same recipe as above, just use Amaretto instead of Whiskey) or another one of my absolute favorite drinks, the Pink Lemonade. In a shaker half-filled with ice cubes, combine vodka, sour mix and cranberry juice. Shake well and strain over ice into a highball glass. Top with spritz of lemon-lime soda with a garnish of lemon slice. This is such a refreshing sour mix, why buy the pre-made kind you find in the store? I can see you all now, relaxing with the perfect cocktail in hand. Go on, enjoy. You deserve it. I think I’ve had a whiskey sour and LIKED it and I hate whiskey, I’m adding these ingredients so we can have gooooood margaritas this weekend. Whiskey is not my favorite either, but with this sour mix, it is divine! This might be bad for me to have on hand! I love sour mix with Midori! It’s like an adult ecto cooler 🙂 Pinning this one! Midori sours are sogood too! I am not a wisky drinker, but I really want to try making this sour mix and trying it with different things. Who knows, I may even get brave enough to try that whiskey sour! Try the lemonade recipe! Yummy!